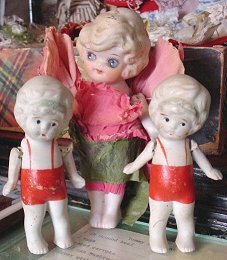 During the late teens and early 1920's Kewpie dolls and Kewpie type, all bisque were favorites those days. The bathing beauties have their original ribbons and mohair for wigs. During the '30s, Betty Boop type dolls from Japan were the rage. 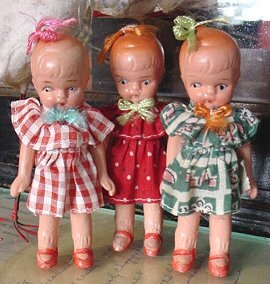 During the 1940s all bisque dolls were imported mainly from Japan. They were found mostly in the local 5 and 10 cents store. The little girls in their original dresses bear a paper "Japan" tag. Antique Bisque Dolls of this type are discovered in stores that were closed and left with merchandise intact. Old stock such as these are delightful as they have never been sold or played with. 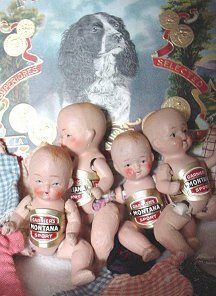 Marked "Occupied Japan," the group of babies frolicking in an old local cigar box were also a part of the old stock from a store closed in the early 1950s. The addition of collectible cigar bands from this vicinity was a temptation I could not resist. 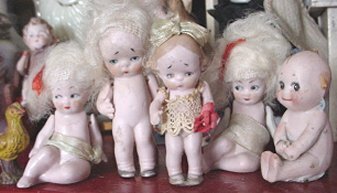 eBay has a rather large set of listings of vintage Bisque dolls for sale, if you are interested in a purchase, or to find values if looking for costs, it is necessary to register with eBay. Bay is an excellent website for "value" information about dolls, or most anything else for that matter--however, to see what something has sold for, registration is required, so if you are looking for past sales of any particular doll, please register.